MOSCOW, January 9. /TASS/. Thirty vintage Soviet tanks T-34-85 have returned to Russia from Laos, where they have been in active service since 1987, the Russian Defense Ministry’s press-service has said. All vehicles are in working order. "The tanks have traveled more than 4,500 kilometers by sea to Vladivostok. From there they will be delivered by train to Naro-Fominsk, near Moscow," the news release runs. The tanks’ return to Russia, just as their handover to Laos three decades ago, is part of military-technical cooperation between Moscow and Vientian. The combat vehicles have repeatedly confirmed their reputation of the best medium tank of World War II. The decision on their return to Russia was made a year ago, when Russian Defense Minister Sergei Shoigu visited Laos. The T-34 is deservedly considered the best medium tank of its day. It has set "a dozen records, which apparently will never be surpassed." Mass production is one of them. In 1940-1946 more than 58,000 tanks of this type were made. Seven decades after World War II very few fully operational samples have survived. It has turned out that far from all T-34s were turned into monuments or put on museum display. Some of them remained in active service until just recently side by side with their younger counterparts. 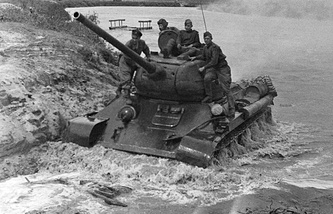 Russia’s television channel Zvezda earlier said the T-34-85 tanks provided for Laos had been manufactured in 1944. Tank battalion commander Khampong Tummanivong then told Zvezda his battalion had 31 tanks. More were in service in other battalions. Before delivery to Laos none of the T-34s had undergone upgrade or adjustment to tropical or subequatorial climates. The T-34 tanks Laos has returned to Russia will be used in May 9 V-Day parades in different Russian cities, for updating and expanding museum expositions and making films about World War II, the Defense Ministry said.